Hunt for prey and discover the meaning of evolutionary “fitness” in this physically active group game. In this simulation game, teams of predators equipped with genetically different “mouths” (utensils) hunt for “prey” (assorted beans). Over several “generations” of play, the fittest among the predators and prey dominate the population, modeling the evolutionary process of natural selection. Note: This game works best with a group of 15 or more people. See Teaching Tips, below, for ways to accommodate smaller groups. Mark off a zone about 15 x 15 feet (5 x 5 meters) square to serve as a habitat. Be careful not to use any materials that could potentially trip or injure someone. You can also designate existing landmarks, such as trees or sidewalks, to mark the boundaries of the habitat. Count out 100 of each of the four different-colored beans and place them into a container. Mix thoroughly. Using a marker, make grids on your butcher paper or flip chart so you can keep track of at least three generations of data. The data grid of a sample game is shown below. Divide participants into three or more equal-sized predator groups (five or six people per group is optimal, but other sizes will work). You’ll also need one person to keep time (the Timer), and one or more individuals to set up and adjust the bean numbers over the generations, record the data, and enforce the rules. Randomly assign each predator group a type of “mouth.” For instance, one group might use their dominant hand (one hand only); others might use forks, knives, spoons, or chopsticks. a. All bean-prey are of equal value. b. Only the assigned “mouth” can be used to capture prey. c. Captured prey must be placed into the stomach-cup to count. d. Prey may not be scraped or shoved into the stomach-cup; the cup must never touch the ground. e. Prey may be captured from another predator’s mouth, but not from another predator’s stomach. g. Each round of hunting lasts one minute. h. All predators must stop hunting as soon as time is called (when the Timer calls “STOP!”); prey that is in the mouth, but not yet in the stomach, must be dropped. Each one-minute round of play represents one reproductive generation for both predators and prey. After the first round, calculations are done, adjustments made, and subsequent rounds are played. Ideally, participants should play at least three rounds before examining the final results. Begin with predators gathered, standing with their backs to the habitat. The designated Timer then spreads the initial 400 prey beans randomly around the habitat, and then calls "GO!" Predators turn around, enter the territory, and collect as many prey as possible—while following the rules. After one minute, the Timer calls "STOP!" All predators stop hunting and participants gather with their group outside the habitat. If any predator is caught violating the rules, they and the beans they have captured are eliminated from the group. Step 1: Gather data for each group: Have members tally the number of captures for each type of bean, and add them together. For example, if the five members of the Hand Group captured 10, 8, 4, 7, and 3 red prey, respectively, their group captured 32 red prey in total. Record data for each group in the Generation 1 table, filling in the rest of the chart as indicated. When all data are recorded, add together the total number of prey captured by all groups and divide by the number of groups to calculate the average number of prey captured. Step 2: Adjust for the number of predators surviving: Before playing the next round (Generation 2), use the average number of prey captured to adjust group sizes—a change that represents the relative success of each kind of predator. Groups that captured more than the average number of prey gain a member; those that captured fewer than the average number of prey lose a member. 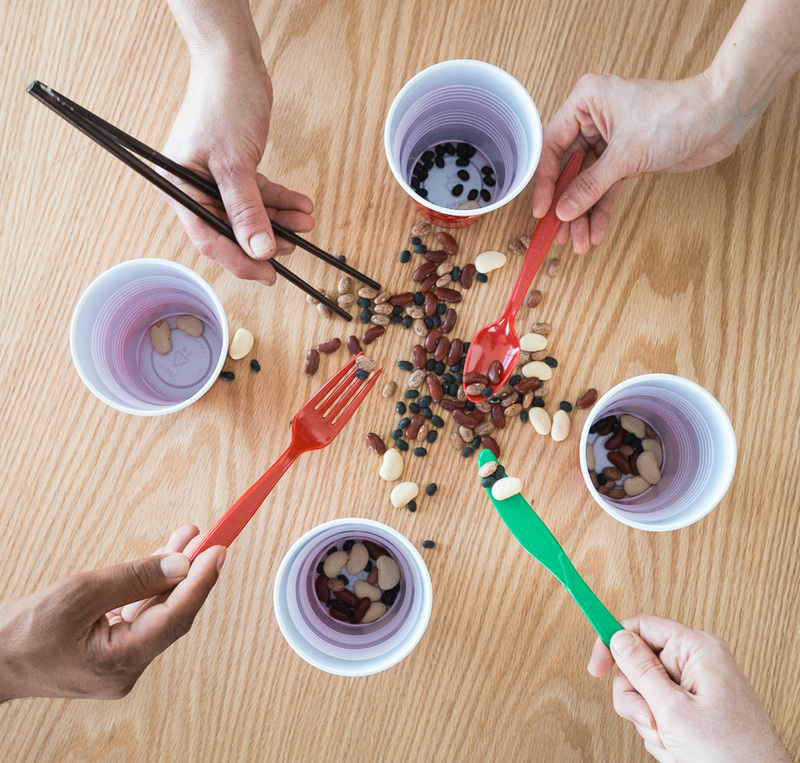 For example, if the Chopsticks Group captures fewer than the average number of prey, and the Hand Group captures more than the average number of prey, one member of the Chopsticks Group is transformed into a member of the Hand Group for the next round. Step 3: Adjust for the number of prey surviving: Likewise, use the data generated to adjust the size of the prey groups to represent the survival rate of each type. Find the number of each prey type remaining in the habitat at the end of the round. Since each type of prey (color of bean) started with 100 individuals, the number remaining for the first round will be the original 100, minus the total number of prey type captured. For example, if all predators together captured a total of 11 black-bean prey, there would be 89 remaining. Assume that each remaining prey member will reproduce one individual. So—for this example—we would count out an additional 89 black beans and put them in the bowl. Repeat this process for each of the remaining prey types. Click here to download an example data set and calculations. When you’re done, examine the results. Do you see any trends in population numbers? What explanation(s) might account for these trends? Did any of the types of predator or prey go “extinct”? Why? In this simulation, you can witness a biological process known as natural selection play out in real time before your eyes. To be clear, evolutionary fitness has nothing to do with working out at the gym. Instead, it refers to the traits, determined by genes, which equip a population to survive and reproduce in a particular habitat. Traits that enhance the survival and reproductive fitness of an individual are passed along to future generations in that population. Traits that are detrimental, or do not allow an organism to adequately compete for resources, tend to cause that organism to die early, leaving few or no progeny. Over millions of years, natural selection has resulted in the astonishing variety of organisms that inhabit the earth. As you play this game over several generations, you’ll see that some predator variants are more evolutionarily fit—that is, better equipped—to capture prey (resources) than others. As a result, more offspring survive and pass along this trait. The variants that catch the fewest number of prey are not evolutionarily fit. They do not reproduce well, so their numbers are reduced with each round. Likewise, certain populations of bean-prey evade capture more successfully than others. In this simulation, we assume each prey survivor reproduces one individual in each generation. Those variants that elude predation go on to reproduce, and their numbers increase. Those that are more easily preyed upon do not reproduce; their numbers decrease, and they may eventually become extinct. Tell participants that one of the predator groups has very low genetic variability because they've been isolated for so long. A disease ravages the entire population, modifying or destroying their prey-capturing tools. Simulate the change by altering the predator’s ability to hunt—breaking the tines on forks, for instance, or allowing the Hand Group to use only one finger. These groups will rapidly decrease in size over a few generations. This change illustrates the danger that lack of diversity in a population presents. This activity can be simplified by having only one type of prey, or one type of predator. Being a predator includes bending down and occasional physical contact, so some participants may not be able or willing to participate. Those who do not become “predators” can fill one of many non-predator roles, such as starting and stopping the timer, helping to gather and post data, counting out the beans for the next generation, or serving as a referee to enforce the rules. Data may be graphed to facilitate visualizing changes in predator and prey populations over time. For example, a line graph could show the number of generations on the x-axis, and the number of each different bean type on the y-axis, using different colors of ink or symbols to track each bean type. A similar graph could track the change in predator numbers over the generations. A single activity cannot address the complexities of all evolution, natural selection, and predator/prey interactions. You may want to lead a discussion about other factors involved in evolution, such as migration, mutation, and natural disasters.